Rhythm King And Her Friends (Kitty-yo records) miscela e sintetizza con sofisticata intensità queer, sonorità elettroniche con melodie pop. Nei loro live i campionatori e le drum machine sono affiancati dai tradizionali chitarra/basso/batteria con liriche a due voci in inglese, francese e bulgaro. Dopo numerosi concerti in Europa e in America insieme a Le Tigre, Electrelane, Stereo Total, Lizzy on X,Cobra Killer, le RK&HF hanno recentemente registrato l’album Front of luxury, in cui atmosfere dance e beat sperimentali le hanno portate ad essere paragonate per energia a band come Stereolab o Luscious Jackson. Rhythm King And Her Friends (Kitty-yo records) mixes and synthetises with a sofisticated queer intensity, electro sounds with pop melodies. In their live sets, there are samplers and drum machines next to traditional guitar/bass/drum with lyrics sung in two voices in English, French and Bulgarian. 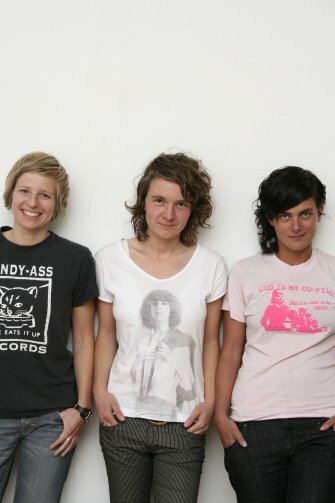 After many concerts in Europe and America with Le Tigre, Electrelane, Stereo Total, Lizzy on X,Cobra Killer, RK&HF has recentely recorded the album Front of luxury, where dance ambient and experimental beats creates a comparison between their energy and that of bands such as Stereolab or Luscious Jackson.